Rubber products can remain in inventory for long periods of time. Shelf life, the storage period prior to part installation, varies by elastomer type. Storage conditions such as temperature, humidity, ozone, and exposure to light also affect the shelf life of rubber products. 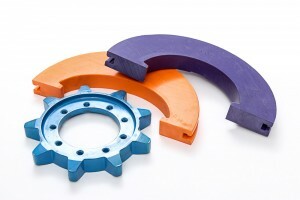 By understanding these factors and best practices, buyers can make informed decisions about sourcing elastomers and storing die cut seals, gaskets, and O-rings. For organizations that don’t have their own shelf life standards, Aerospace Recommended Practice (ARP) 5316 provides guidelines for the storage of rubber products. ARP 5316 is a recommended practice rather than a binding specification, but it’s used in various industries. Designed for aerospace applications, ARP 5316 was published originally by the Society of Aerospace Engineers (SAE). Environmental conditions such as high temperatures and high humidity can cause unwanted physical changes in rubber products. Proper storage conditions won’t guarantee product quality, but they do promote storage life. For best results, ARP 5316 recommends storing rubber parts according to the following guidelines. For organizations that source elastomeric materials and store die cut rubber products, the following table contains shelf life recommendations by elastomer type. Buyers can use this information to make sourcing decisions that account for the time a batch of rubber has been inventory, and the expected length of time that die cut rubber parts will be stored. Interstate Specialty Products supplies die cut gaskets, seals, and O-rings in a wide variety of part sizes and product quantities. We work with a trusted network of material suppliers, and use precision die cutting to achieve tight tolerances according to your exact requirements. For more information about shelf life and the die cut rubber products we can supply, please contact us on-line.